As part of its effort to improve the student-athlete experience, Temple unveiled the newly renovated Nancy and Donald Resnick Academic Support Center on Monday. The university began renovating the center in August. Located on the ground floor at McGonigle Hall, the area houses six private student services rooms for tutoring, peer mentoring and private study; 10 new offices for advisers and learning specialists; an expanded computer lab with 36 computers; and a seating capacity that has gone from 34 to approximately 100. "This is very important for our student-athletes," athletic director Kevin Clark said. "Our focus is to change the culture and the facilities that we have here at athletics. We really want to take our program to the next level and this is part of it. 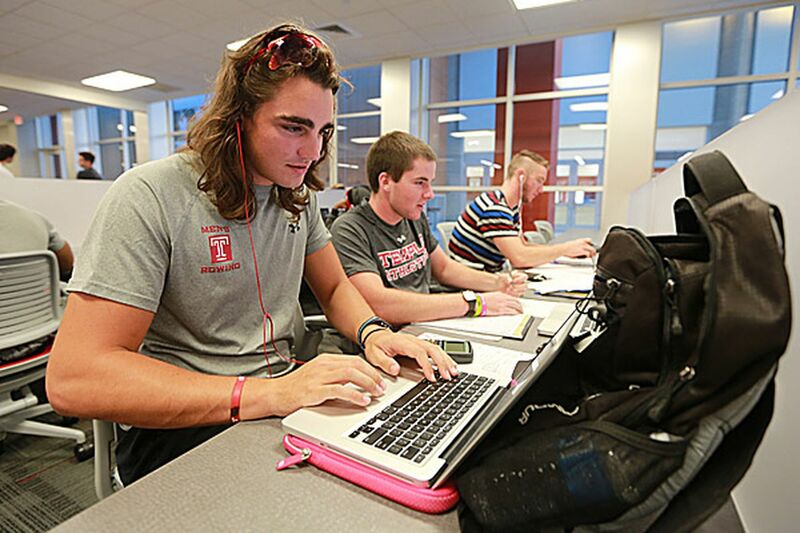 At the end of the day, our student-athletes are students first and we want to provide the academic support for them. "This is just the beginning of things for our athletic department. Our goal is to make sure that our student-athletes have the best experience possible and this is part of it." Temple announced plans to eliminate seven intercollegiate sports last December. The university restored men's and women's rowing in February, but the baseball, softball, men's gymnastics and men's indoor and spring track and field teams are gone. Conversely, Temple, which has recently upgraded its football and men's and women's basketball locker rooms, has begun work designed at improving its Olympic sports by adding more staff and upgrading their facilities. "It is part of a vision to improve every aspect of Temple sports," Clark said. The support center stands behind 20-foot windows that had been covered by paper until the work was completed last week. The center's director, Justin Miller, said that the renovations put Temple's facility on par with "any such center" in the American Athletic Conference. "It's a first-class facility that everyone here is behind," Miller said. "It's a collaborative effort that drew so many people in from both the academic and athletic sides." The Resnick Center was bustling with student-athletes using its services on Monday. Among them was Krissy Gallivan, a sophomore midfielder on the women's lacrosse team. Majoring in international business, the Big East all-academic selection raved about the new facility. "Oh, my God," Gallivan said. "It's stunning. It shows that they are making a huge commitment and investing in our success." Staying at the Linc. Asked about the rumor regarding a new on-campus stadium, Clark said the Owls would continue to use Lincoln Financial Field as their home for football. "As far as the stadium, we have a great relationship with the Eagles," Clark said. "We have a four-year agreement with them and we are going to honor it."